Our client was the owner of a portfolio of high-rise residential buildings. It planned to install wind turbines on several of its buildings. The aim was to enhance its reputation for sustainability by reducing greenhouse gas emissions, offsetting energy use from other sources and striving for a ‘zero carbon’ outcome. The financial benefits were to be shared with the tenants of the buildings. The risk assessment we facilitated provided a comprehensive understanding of the challenges the project would face and how they were related to one another. We were asked to facilitate a risk assessment for the pilot study, an initial installation on one building. It was hoped the risk assessment outcomes would be a useful template for other similar installations on the remainder of the buildings in the portfolio. They do not need to move if the wind direction changes, so they are simpler to design, build and maintain. Only a short period was available for the risk assessment, so only a small set of key elements was used for structuring the workshop (Table 1). Nevertheless, it proved sufficient for the owner to gain an understanding of the main risks and develop an effective approach to the installation. The key elements were elaborated in the mind map shown in Figure 1, to stimulate the exploration of risks and ensure the subject was covered comprehensively. The key elements were addressed one at a time, capturing risks in terms of a high level descriptive title with multiple causes, multiple impacts and a list of existing controls. Two risks were rated extreme: an adverse reaction to the visual impression of the turbines, and interference with tenants on the top floor arising from the structural fixing of the turbines on the roof. These were allocated to individuals for priority attention. Ten risks were rated high. Risk owners were allocated to these. Seven risks were assessed as being almost certain to affect the project. Their high likelihood meant that these were effectively planning assumptions that had been overlooked up to that point. Two risks were identified with potentially catastrophic consequences although both were considered to have a very low likelihood of affecting the project. Many of the risks interacted with one another. 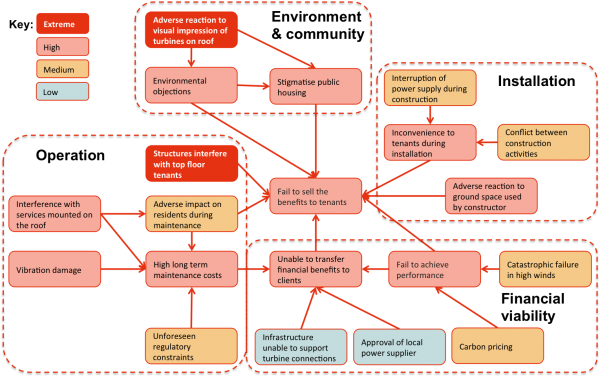 A pictorial representation of the connections was prepared to aid in understanding options for risk treatment (Figure 2). It is notable that all risks lead ultimately to the consequence of failing to sell the idea to the tenants, an outcome that is fundamental to the success of this project. The output of the workshop was used to refine the initial plans for the turbine installation and prepare a submission for funding and approval to proceed. At a relatively early stage in the development of the project proposal, Broadleaf was able to add significant value with a modest level of effort. We did so with a process that not only exposed risks that could affect the work but also identified important consequences the project was almost certain to encounter that had not been allowed for to that point. The nature of the risks and options for treating them were clarified by examining the relationships between risks, focusing on the potential for one risk to stimulate or exacerbate another. As well as identifying specific actions and areas for attention, the understanding generated by the risk assessment gave the planning team added confidence in the value of the work they were doing, the way they were approaching it and the outcomes that could be achieved. A national construction company was part of a consortium bidding for a public private partnership. The winning bidder would have to deliver a large number of dwelling units at sites across Australia, and maintain them for an extended period. We worked with the contractor to develop quantitative models of the uncertainty in the design and construction costs for the project, taking into account common features, common sources of uncertainty and regional variations.